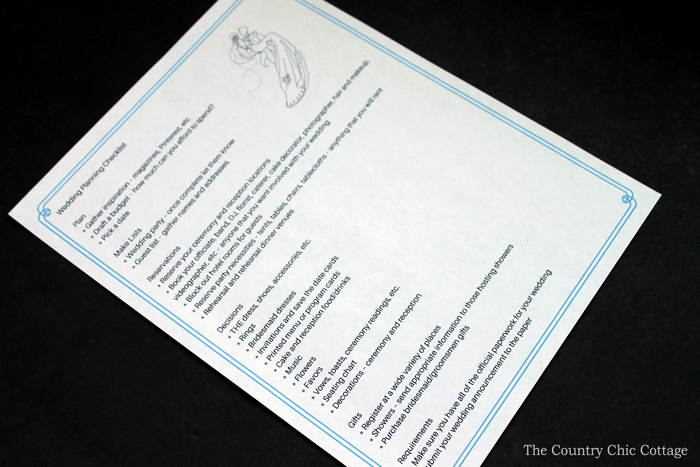 A free printable wedding planner is something everyone can use that is planning a wedding. Trust me. I am knee deep in wedding plans around here. My daughter is getting married next month and I keep going through a checklist in my mind wondering what I have forgotten. 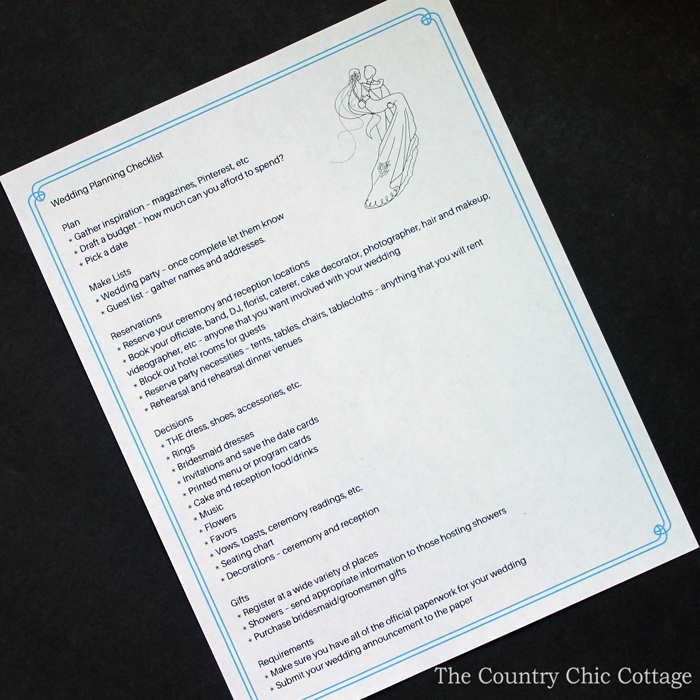 Print our wedding planner to be sure that you don’t forget anything for your big day! 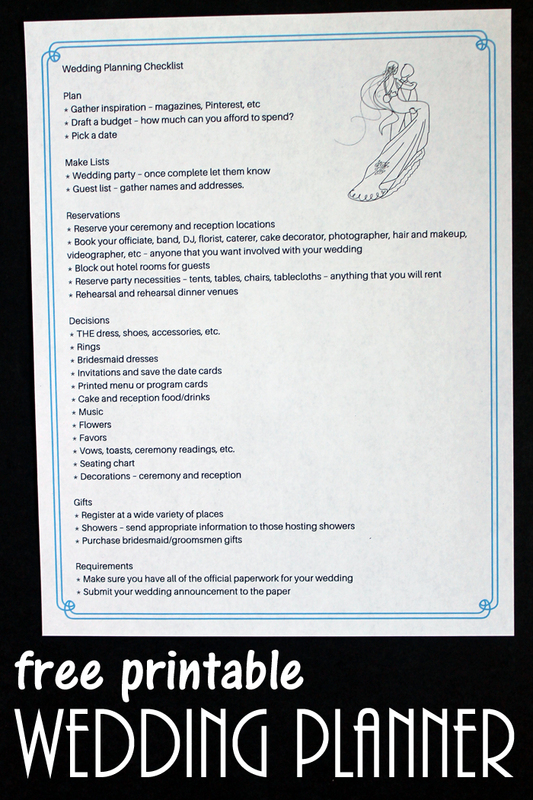 Click here to print the wedding planner. Our free printable wedding planner runs through everything from planning, making lists, reservations, decisions that need to be made, and more. Print the list today and start taking notes. Then mark things off of the list as you get them completed. By the big day, you will be prepared, organized, and ready for anything that comes at you. Or at least that is what I am hoping. Cross your fingers for me y’all. Next month is speeding at me like a freight train and I am just trying to fit everything in! I recommend printing this free printable wedding planner but also keeping a notebook with important phone numbers, addresses, to do lists, and so much more. It has been a life saver to me! I love having everything in one place so I can easily reference it when I need it. And y’all….checking something off of a to-do list is my ultimate favorite thing to do in life! If you can’t afford to hire a wedding planner, use our checklist instead. It will keep you on task when you are planning your own DIY wedding. Want something a little more comprehensive than our checklist? Try clicking here to get a pro planner for weddings for free! That is way more than we needed for our simple wedding but if you are trying to plan a HUGE wedding yourself, it just might work for you. Now get out there and be your own wedding planner! You will save a ton of money if you do it correctly!